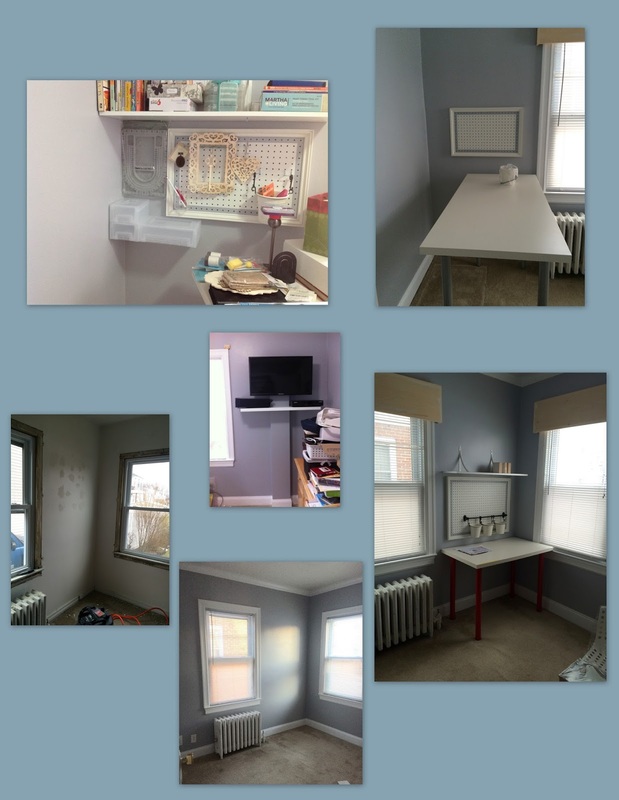 At the end of 2014 I had quite a few projects planned for 2015 one was to turn my son's old room into a craft room. A big project but I had help with that and so much more. I am back in the head space to post to the blog, yeah! So here is a look back at my creative and crafting adventures over 2015. I decided to add a nice sign for the craft room door, I found a pre-made sign at Michael's, and added a pre-made shape in back and glue them together, add a little paint and a cord and sign was done. 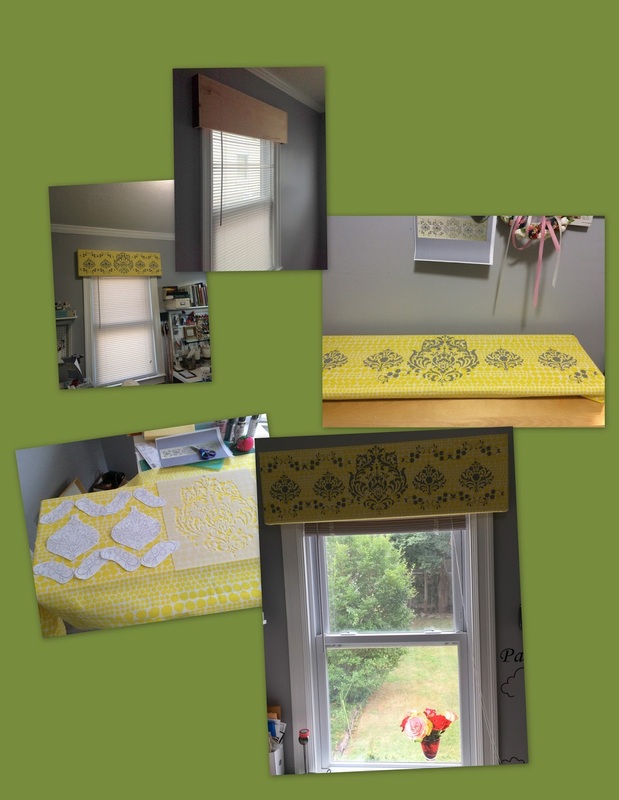 The craft room has two windows and I wanted to keep the window treatment minimal. My thought why not a valance, but not just any old valance, a wooden, fabric wrapped stenciled valance, oh boy I never take the simple route. So I searched Amazon until I found the stencil of my dreams, then created a layout, as you can see on the wall is the computer generated vision of my stencil layout design, not only is he good at carpentry (wooden valance), but also good on a MAC. This is a plant table I had purchased at Kmart many moons ago, to use as a side table. I decided to add the table to the craft room, but first give it a bit of antique craftiness like when I did French country small table with the exception I went with stencils to add the design, and discover how much I enjoy stenciling. I painted the table white, and then I add the design, it was so pristine and white I was tempted to keep it like that, naw! let's antique it. We re-did all the moldings around the windows and doors, and added molding to the ceiling with a larger base molding for a nice contrast. I say we but he did he big bits and I did the small bits like helping to paint and I learnt how to repair small imperfections in the wall with spackling compound, and I became obsessed, he had to pull me to a new spot it is like play dough. .
We painted the room a nice grey with white moldings, kept the beige carpet that was still in good condition. On to the organizing and decorating, that is all me. 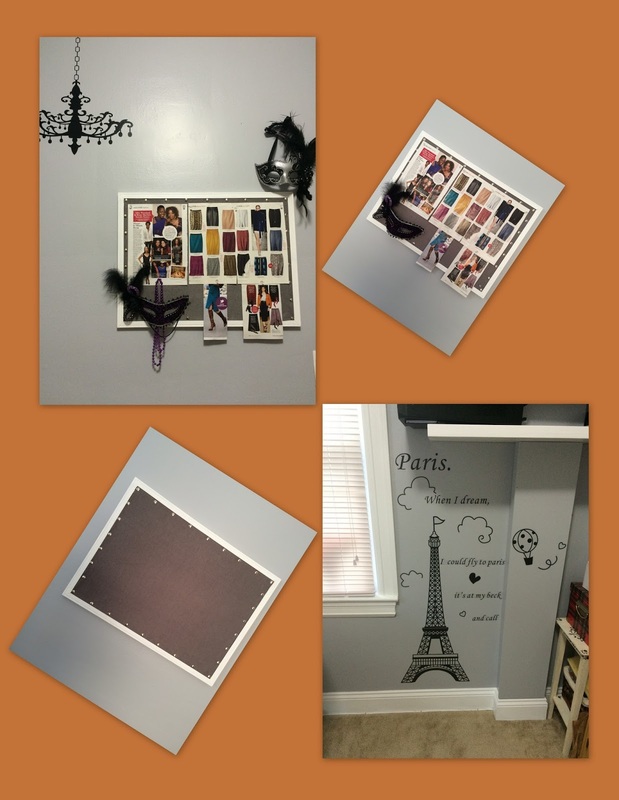 On Amazon found cool Chandelier and a Paris decal for walls plus added a few masks to spice it up. I took an old cork notice board, added some fabric, some tacks and painted frame and turn into inspiration board. We turned a closed off doorway into neat little niche for storing my paints, quilting ruler and much more. My mermaid painting from Paint Nite March 2016 looks good in the picture. I decided to help preserve and update and old chest his granddad had built and given to him and he was fully on-board. Carpentry runs in the blood, because he did all the additional cuts and wood work for the chest, adding a new top and trim on the drawers. This was a project long in the making, and since the soon to be craft room was empty, perfect opportunity to rework the chest in the space. The drawers on the left are used for clothing, and on the right there was one large door and one drawer on bottom. We created 3 fake drawers on the door and cut an opening to install a smoke glass window for cable box and DVR player, the right side is also used to store DVDs & CDs and the TV will sit on top. The Chest is a box, so the new designed called for a top that overhang to add more character. The back of the Chest had holes for wires, I won the much heated debate of adding a stencil design as an accent, I think it looks cool. Even the new knobs got a makeover a new silvery finish. The drawers also got an update with raised trim. 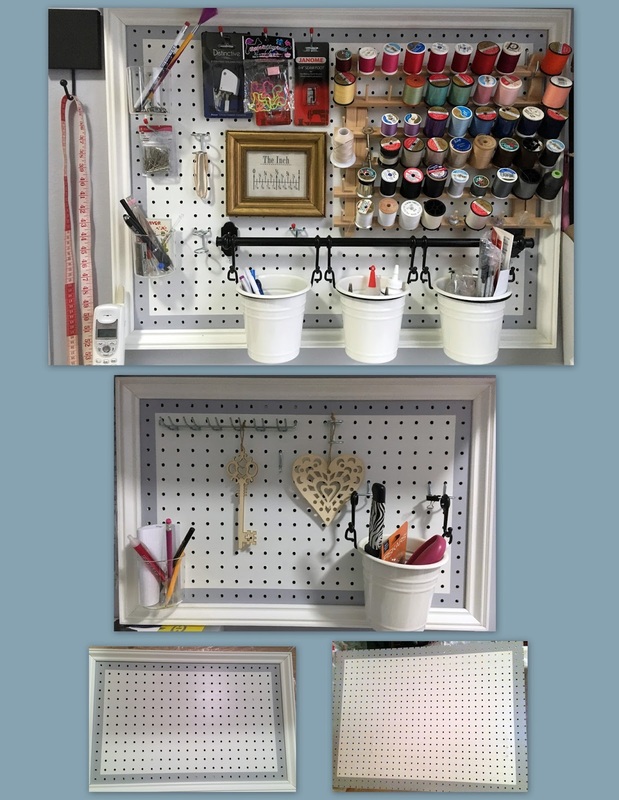 I was inspired by the various sites online that shared how to use peg board in your craft room for organization. I especially liked the one on Honeybearlane.com. I really liked the use of the iKea buckets; my craft room is iKea out so this was a perfect addition. For my space we purchase the pegboard at Home Depot, I needed two pegboard organizers for two unique areas of the room, one for my craft area and one for my sewing area. I went with white background with a grey border to match the color of the craft room and he also added the frames for me so helpful. I could not have done it without his help big time. The large board held 3 buckets and the small just 1 bucket. I am very happy with this project.